« Day 112 – Juan E. and Alex C.
Day 113 – Sammy N.
On the morning of August 7, 1998, Sammy woke up, did his chores, and went about his day like any other day. Unfortunately, August 7th was not just another day. Not if you lived in Nairobi, Kenya or Dar es Saleem, Tanzania. Between 10:30 am and 10:40 am local time, suicide bombers in trucks laden with explosives parked outside the US embassies in both cities and almost simultaneously detonated their payloads. In Nairobi, more than 200 people were killed, and an estimated 4,000 wounded; in Dar es Salaam, there were 11 killed and almost 100 wounded. Despite being targeted at Americans, the victims were largely local citizens. Only 12 Americans were killed. Osama bin Laden is said to be responsible for the attacks. Unfortunately Sammy was in the wrong place at the wrong time. 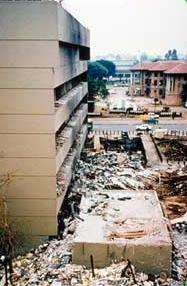 He ended up under the rubble in Nairobi for three days. He survived with only two broken legs and some other minor injuries. Sadly he lost three business associates that morning. In 2001 Sammy came to the US to testify in the trials against the alleged perpetrators of the horrible massacre. He then came back in 2007 to attend a conference but ended up staying due to the violence that erupted in his home country after incumbent President Mwai Kibaki was declared the winner of the presidential election held on December 27, 2007. Now homeless, he has been here since then selling the Street Sense paper. You can usually find him around the intersection where Connecticut, M, and 18th Streets come together. 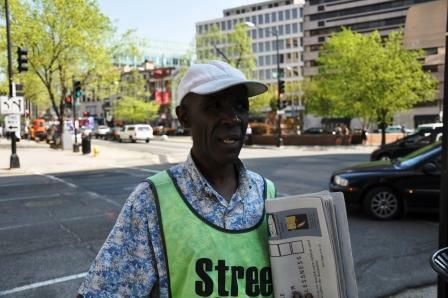 His goal is to return to Kenya by the end of the year and start a street paper similar to Street Sense. “There are almost no homeless in Kenya” he told me. People may stay with family or in what might be considered substandard housing from a US perspective, but they don’t have hardly anyone he said that you would find sleeping on the streets of Nairobi. Sammy let me ask him a few questions on camera. As you saw, Sammy plans to save my $10 and put it toward his street paper venture in Kenya when he returns next year. If you have any interest in helping Sammy start his paper, he is actively looking to work with partners and individuals. Drop me a note and I can connect you with him. Despite the terrible events of August 1998, Sammy manages to keep an optimistic spirit and maintains hope for a better tomorrow. Cool story! The site continues to amaze and inspire me about all the interesting things people everywhere have seen, been a part of and lived though. I wish Sammy the best of luck! I would love to offer my design and layout services to Sammy’s newspaper. Please let me know how I can help. I encounter Sammy N. regularly. He is a kind and pleasant man. He directed me to this site to find out more about him and the activisim generated by your actions. Keep up the good work! I regularly get my Street Sense paper from Sammy and am happy to give him a donation beyond the suggested. I usually find him around L & Vermont or L & 15th when I go out to get my lunch. He is always cheerful, sincere and polite. I hope very much that his dream of returning to Kenya and starting a newspaper works out for the best. Today is Wednesday Dec. 14th.